One of the best things about digital media is the ability to place information into the file header called EXIF data, and one useful bit of information that can be stored is the longitude and latitude. Having the GPS coordinates embedded into the file header means that you can go back to a photo from 3, 4 or 6 years back and you can find out where you took it and best of all most photo sharing websites will display a map of where you have taken photos. There are a few ways of doing this, some cameras have built in GPS but these are very expensive and tend not to work very well, a separate GPS tracker but this is just another item to carry around and will probably set you back £100 or you could use your smart phone which you would most probably have with you at all times anyway. Most smart phones nowadays have built in GPS and will track your movements when you want them to (or even when you don’t most probably), you don’t have to have a flashy iPhone; all you need is a phone that will export a GPX track. I do have an iPhone and unfortunately you’ll have to buy an app that will record your tracks in GPX form, I tried using several free but these were fairly clunky and didn’t work that well. After much research I bought “Geotag Photos Pro” and at the time of purchase was £2.39, but it really is a great app, the interface may seem a bit basic but don’t let that fool you! 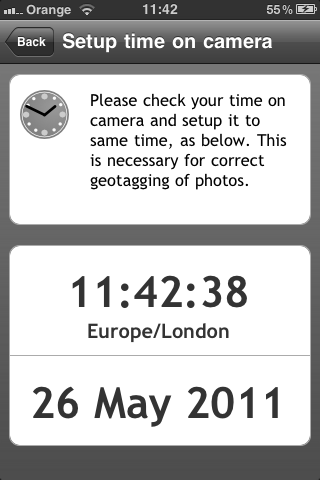 When it comes to Geo Tagging the main thing to remember is to make sure that the camera time and phone time are in sync; the phone will log the GPS data and attach a time stamp to the coordinates and the geotagging software will try to match the time of when the photo was taken to closest time stamp in the GPX file (this is what the exported GPS data is called). 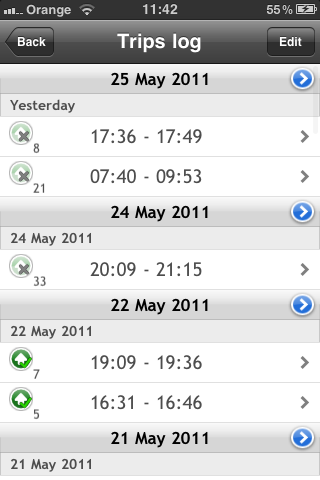 The first things to do are to set the how often the GPS loction is logged. One of the best things about this app is that it doesn’t leave the gps on, it will just turn it on when it is time to record a coordinate, so if you want to preserve battery life and you’re not moving around set this to every few minutes, but be aware that this won’t be very accurate if you are on the move. Here is what the screen like, I’ve set my phone to log every 30 secs. Now go into setup camera time and set the time on your camera to what is displayed here. Once you’ve set the auto log and set the camera time create a new trip and press record. The other good thing about this app is that you don’t need to upload the data to a website to obtain the track (although you can for archieve purposes), by pressing the blue circle you will have options of deleting/rename a trip or exporting the trip via email or itunes. You can also check whether or not you have uploaded the trip to the Geotag Photos Pro website, if you have a symbol of a house with a tick it means that the trip has been uploaded. To upload your trip go back to the home screen and press settings & upload, you will need to have an account setup do this, if you dont have one select “Link with Geotagphotos.net”, once your account has been set up go back a page and select upload logged data and then start upload. 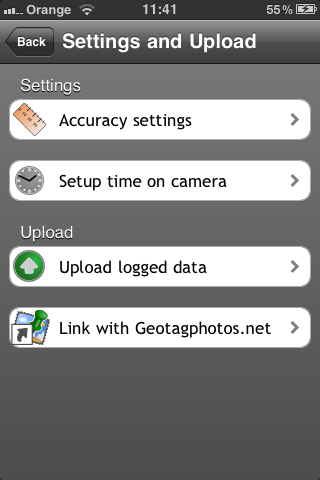 When the trips have been uploaded you will be able to delete them off of your phone and they will still be available on the Geotagphotos.net website. I'm Dan Borg, and welcome to my blog. I have an interest in photography and like to use what ever spare time taking photos, I also enjoy building and modifying things and always seem to have some sort of project on the go!!. I'm a Telecine engineer and I work in the post production industry based around soho in London.